:: The U.S. Jobs Deficit declined by 73,000 in September, however since it increased by 72,000 just one month prior, the result was a net improvement of an entire 1,000 jobs since July. The ever elusive jobs deficit rose from 11,760,000 in July to 11,832,000 in August, and then pulled back to 11,759,000 based on yesterday’s Employment Situation Report. Employers added 114,000 jobs for the month, while the July and August figures were revised upward by 86,000. Thus, the U.S. realized a net gain of an even 200,000 Nonfarm jobs in September. And, since the U.S. needs to create a minimum of 127,000 jobs a month solely to keep pace with population growth; this results in an overall improvement to the jobs deficit of 73,000, as compared to the prior report. However, since the deficit increased by 72,000 in August, it really amounts to a net improvement of a mere 1,000 jobs since July. Here’s the big picture. Today 12,088,000 Americans are officially unemployed (down from 12,544,000 in August). Another 6,427,000 are unemployed and want jobs, but have dropped out of the labor force and are not officially counted (down from 7,031,000 in August). Still another 8,613,000 are employed part-time for economic reasons (up from 8,031,000 in August). What this means is that 27,128,000 American’s are still unemployed or underemployed, an amount essentially unchanged since August. The truth is that if Barack Obama’s trickle-down-government approach had worked, then the jobs deficit wouldn’t be worse today than it was in December 2009, when it registered in at 11,479,000, yet it is. In light of September’s minuscule improvement, how many jobs must now be created each month in order to reach full-employment? How long will this take? And, in light of the answer, is another four years of Obamanomics the cure? But first here’s a quick synopsis. What is the jobs deficit? — It’s a measure of how far the United States has strayed from full-employment during the current economic recovery. More specifically, it tracks the shortfall in the number of jobs needed to keep up with population growth, and to recover those lost since the Great Recession. Basically, the U.S. has needed to add 127,000 jobs a month since December 2007, the month the recession commenced, simply to keep up with population growth. Thus, a minimum of 7,366,000 new jobs have been needed since the recession began (58 months times 127,000). 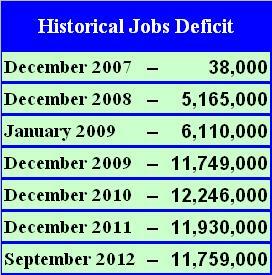 However, instead of adding jobs, the U.S. has instead lost 4,393,000 (see related table). So since we needed to add a minimum of 7,366,000, but instead lost 4,393,000, the sum of the two equals the current jobs deficit of 11,759,000 (see chart above). Got it? Who initiated the benchmark, some right-wing economist? — No. The idea was actually initiated by Economist Paul Krugman. Here’s a quote from his December 2009 column: “Even if we add 300,000 jobs a month, we’re looking at a prolonged period of suffering — a huge cost from the Great Recession. So that’s kind of a minimal definition of success. Anything less than that, and it’s bad news.” But sadly, since December 2009, the U.S. has only averaged about 127,000 jobs a month. So in other words, we’ve basically been treading water since the measure was first established. For more, see Paul Krugman’s New York Times opinion piece entitled, The Jobs Deficit. In order to keep up with population growth, we would need to create 127,000 jobs times 27 months, or 3,429,000. Add in the need to make up for the jobs deficit and we’re at around 15,188,000 (3,429,000 + 11,759,000) over the next 27 months — or 562,518 jobs a month. In order to keep up with population growth, we would need to create 127,000 jobs times 60 months, or 7,620,000. Add in the need to make up for the jobs deficit and we’re at around 19,379,000 (7,620,000 + 11,759,000) over the next 60 months — or 322,983 jobs a month. Did the U.S. add 562,518 jobs last month? Nope. In fact we haven’t come anywhere close during the entire Obama recovery. Did U.S. employers add 324,200 jobs last month? Nope. We haven’t even come close to that, with the exception of the single month of May 2010, but those were just temporary Census jobs which disappeared in subsequent months. When averaged, the number of Nonfarm jobs created since the end of January of 2009 comes to a loss of -20,000 jobs a month. Well, that doesn’t work. So if we average the number of jobs created over the last 9 months, we arrive at 146,000 a month. That’s better. And when we divide this into the 4,393,000 jobs lost since the recession began, it tells us that at the current pace we should recover the jobs lost to the recession in another 30 months, or 2.5 years. That’s fantastic! It means it will only have taken 6.5 years to get back to square one! The only problem with this less than rosy scenario is that since we still need to create a minimum of 127,000 jobs a month, in order to keep up with population growth, based on the 9-month average, the jobs deficit is only declining by 19,000 jobs a month (146,000 – 127,000). Thus, full-employment is more like 619 months away, or another 52 years. So four more years of the trickle-down-government approach places us on track to reach full-employment by around the year 2064. Huh? Sorry Democrats but, we can’t wait. No matter how you spin the numbers, they aren’t good. Until we see the number of Nonfarm jobs expanding by a minimum of 322,983 a month, for a sustained period of at least five years, anything short is just bad news. The addition of 114,000 jobs in September was 65% short of the mark required to reach the long-term target. And with the national debt hovering above $16 trillion, and beginning its ascent towards $20 trillion, there’s really no good reason to consider a second Obama term. None! The Obama-Biden program establishes a goal of creating 1,000,000 new manufacturing jobs over the next four years, which would be an improvement, considering their policies have thus far resulted in a loss of 610,000, since January 2009. But that only accounts for a potential of 250,000 jobs per year, or around 21,000 a month. What about the other 300,000 jobs? In stark contrast, the Romney-Ryan Plan includes a goal of creating more than 12,000,000 jobs over the next four years, or more than 250,000 a month. So which plan is most likely in the best interests of the United States? The one we’ve already witnessed for the last four years, or something different? Vote Romney-Ryan for real change. Hey, it’s math! It’s arithmetic! It’s all about relevance! 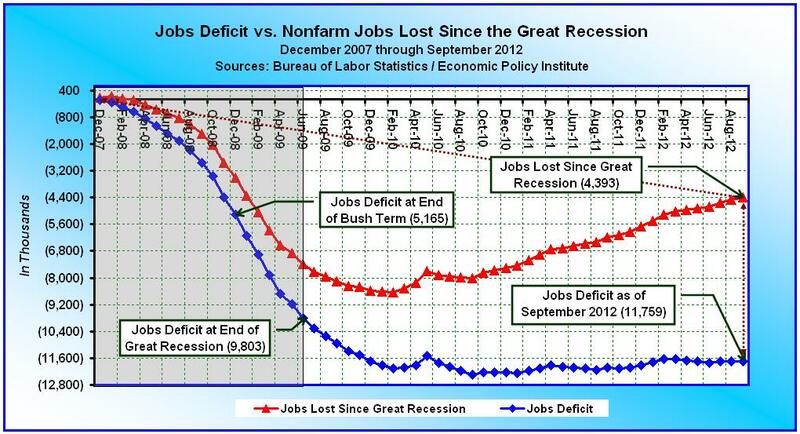 You can’t fool the jobs deficit.